Spicy Indian tomato salad recipe. Indian food is one of my favourite cuisines. It is just so full of flavour. I’ve not yet been to India, but until I do go, I’m just going to cook as much Indian food as I can and dance wildly around my kitchen to my Bollywood soundtracks. This spicy Indian tomato salad recipe is quick and easy to prepare. It is the perfect accompaniment to my Baked Mango Chicken Curry Recipe and Tandoori Chicken recipe. It is pretty spicy, but you can tame the heat by reducing the amount of raw onion and/or cayenne pepper. To bulk the salad up you could add in some diced cucumber – this will also reduce the spiciness. For more tips like this check out my cooking tips for Indian food. Chop the tomatoes into bite-sized chunks. Roughly chop up the coriander/cilantro. Put those three ingredients into a bowl. Add the lemon juice and cayenne pepper. Cover with Clingfilm and leave to marinade on the counter top until ready to serve. The lemon/lime juice will mellow out the flavour of the raw onion, so it is best leave it for at least 15 minutes before tucking in. Just before serving, season with salt. I love how the heat of the cayenne pepper contrasts with the cooling tomatoes. The citrus juice totally takes the bite out of the raw onion but still leaves the onion with a nice crunch. This gives the salad some contrasting textures as well as packing some strong flavours. It is one of my favourite salads to serve with my Tandoori Chicken Recipe and my Baked Mango Chicken Curry Recipe. It is also a great salad to have when you are trying to lose weight as it is low in calories and full of flavour. The cayenne pepper is said to give your metabolism a little boost too. That may all be NutriBollox but at least it tastes great. To take your Indian recipes to the next level, check out my top tips to improve your Indian cooking. 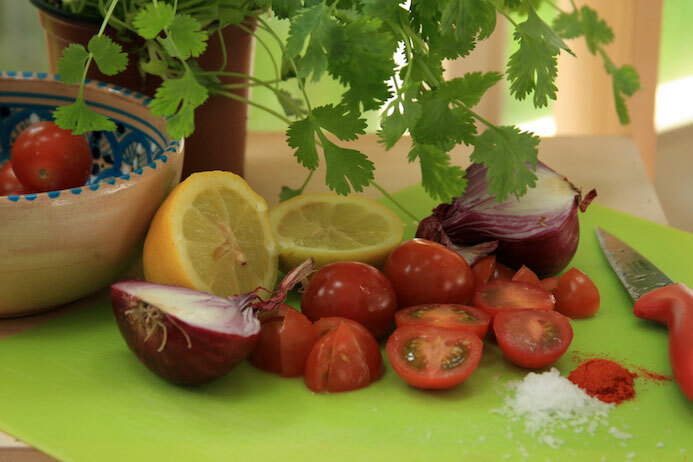 So, what do you think of my Indian tomato salad recipe? Did you try it out? Did you like it? What improvements would you make? Share a photo of your own attempt at this recipe or leave any feedback and comments below, I’d love to hear from you. If you like this spicy Indian tomato salad recipe, you may also like my baked mango chicken curry recipe. And my refreshing mint and cucumber raita recipe. And my tandoori chicken recipe. Don’t forget to check out my cooking tips for Indian food. 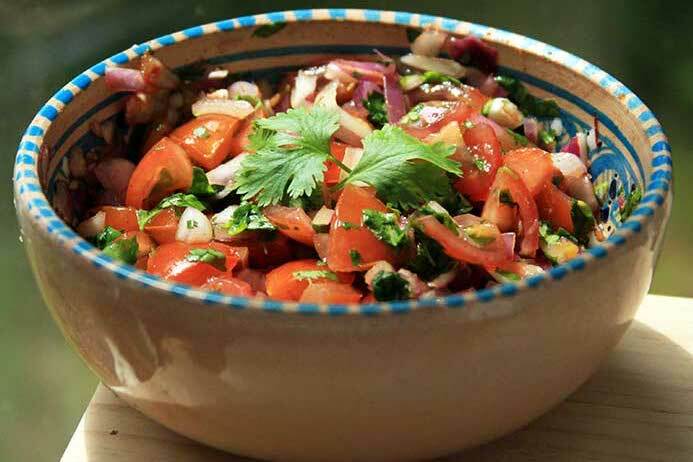 If you like this spicy Indian tomato salad recipe, please share with others. 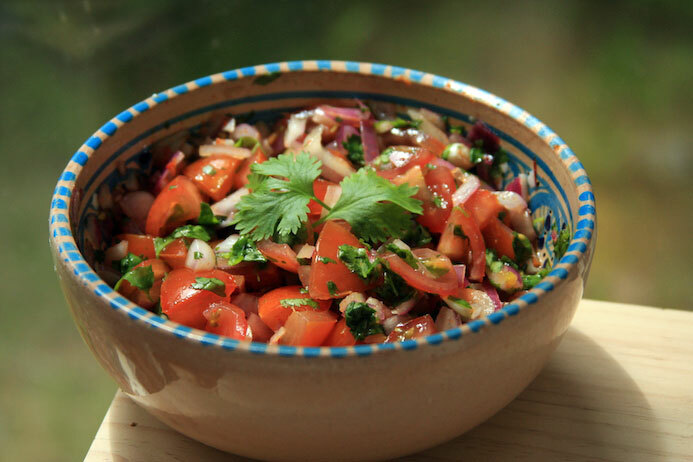 This spicy indian tomato salad recipe is realy looking amazing, i will cook it in my home. Thank you. I hope you find it as tasty as I do. So tasty and delicious food recipe, thanks for sharing.